Having a toilet that leaks at the base is not only a pain in the neck, it also can result in unpleasant smells, unsanitary conditions and a wet surface. Hiring a professional plumber to come fix it can be rather expensive. However, if you can fix it yourself, you can end up saving yourself quite a lot of money. There are several different reasons why your toilet might be leaking at the base. It’s best to figure out what the actual problem is and then go from there. If your toilet leaks at the base when it’s flushed or simply just resting, then take advantage of the information below. One of the main reasons your toilet may be leaking at the base when flushed or at any other time could be due to one or more cracks in the fabric of the bowl. Toilets containing cracks in the bowl will more than likely result in a large pool of water around the base. Empty the water out of the toilet bowl. Use some sealant or some water-proof glue to seal the cracks. Let your toilet dry as long as the instructions on the bottle or package of the glue or sealant tells you to. If the glue or the sealant doesn’t fix the cracks, you may need to invest in a new toilet bowl. Most toilets have a wax seal around their base. This prevents water from leaking out and onto the floor. If the wax seal around the base of your toilet is worn, then it’s time to change it. Although this may sound like a tough job, it’s fairly easy to do as long as you have a helping hand. However, it’s important that you purchase the right wax seal for your needs. If you are unsure, either refer to the owner’s manual or ask a professional. To change the wax seal around the base of your toilet, follow the steps below. Turn off your home’s water supply and begin emptying the water from the toilet bowl and the tank. Disconnect the water supply line with an appropriate sized wrench. You will need to do this by loosing the bolt positioned next to the water tank. Once this bolt has been removed, remove the bolts that hold the toilet to your bathroom floor. You may need to use lubricant to loosen them up. If the bolts are corroded, it’s best to replace them with new bolts. Remove, lift, and set the toilet on the floor upside down or on its side. To prevent the porcelain from being chipped or cracked, you should lay the toilet on either a blanket or a piece of carpet. Apply the new wax seal where the old one as. You want to make sure that you get the new seal on correctly before you reattach the toilet. Take your time and make sure you get it right. When reattaching your toilet, make sure you put the wax seal on right. It should not stick out. In addition to this, you’ll also want to make sure the anchor bolt holes are lined up as well. Once your toilet is positioned correctly, tighten the bolts. However, do not tighten them too much. This can result in cracks to your porcelain toilet. Examine the base of your toilet for leaks, and if everything looks good, turn your water back on, fill up the tank, and flush it a few times. By following these helpful steps, you can effectively fix that bad wax seal and keep that toilet from leaking onto the floor. When completing this job, make sure you have a buddy to help you with the lifting and placement of the toilet. Another reason your toilet might be leaking at the base could be because it wobbles or rocks. 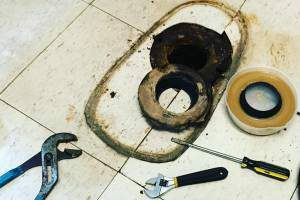 If this is the case for you, then you’ll want to tighten the bolts at the bottom of the toilet with a pair of sturdy pliers. Like mentioned before, it’s important that you don’t tighten them up too much. This could crack the porcelain and damage it leading to more problems. When your toilet is leaking at the base, many people think caulking is the answer when in fact it actually just causes more problems. 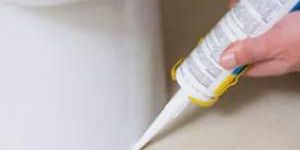 Caulking at the base of your toilet does not stop water from leaking. It’s only purpose is to keep water and other things from getting underneath the base of the toilet. When water does get trapped under the base of the toilet, mold will begin to form and bad odors can follow. This mold can’t be reached and will only get worse. Caulking the base of your toilet is important, but not until after your toilet has been completely fixed and has quit leaking. If you neglect to repair your leaky toilet, there can be some negative outcomes. Not only is a toilet that leaks at the base unsanitary, it also can do a lot of damage to your floors. As water seeps between the tiles day after day after day, the floorboards underneath the tile can start to become warped and disfigured, not to mention growing mold. This can result in thousands of dollars in damage. However, by simply fixing your toilet as soon as possible and caulking the base of your toilet regularly, you can prevent unsanitary conditions, unnecessary odors and property damage.